If a Motorola prototype sounds like the X Phone, is it the X Phone? Update: It looks like we may have a "Ghost" in our hands, literally. According to PhoneArena sources, @evleaks images are legit and show off the X Phone, codenamed Ghost. Sources also say that in addition to AT&T, the phone will head to Verizon and "will support all major carriers," though it's not clear if those are U.S.-only or international carriers as well. A non-disclosure case is said to encapsulate the pictured device, though the real panel shown is the device itself. The "M" will reportedly disappear as it's a marking reserved for prototypes, while the phone will apparently be made of polycarbonate and not metal or Moto's signature Kevlar. That's not all: Though the prototype has a 720p screen, the X Phone is planned to come with 1080p plus 32GB of storage and 2GB of RAM. The screen size is an unconfirmed 4.7-inches. Last but not least, it looks like this phone has a scheduled release of early July, meaning we could get a well-timed earful about it at Google IO. 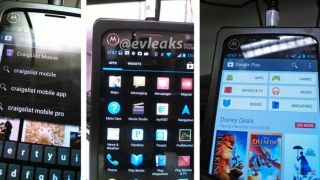 The elusive Motorola X Phone, the rumored first smartphone under the Google-Motorola partnership, may have just been shown off in prototype form thanks to a four-photo leak. The device in question has markings that back up several rumors about the hotly rumored Android phone, first and foremost being the AT&T logo in the top left corner. Another hint is that this composite photo, posted by @evleaks, depicts the purported X Phone with a screen that isn't too large. That's important because it would fit into the "sweet spot" screen category that Motorola design chief Jim Wicks said the company found to be "just about right" for consumers. A second leaked photo of the supposed Motorola prototype gives further, albeit blurry, credence to the fact that this is the Google X Phone. The backside photo reads "Model: XFon-ATT," which almost seems too good to be true. Of course, this is different from the model number that was floating around the internet this week, XT1055. A benchmarking app that caught the XT1055 claimed it to be a 1.7GHz quad-core processing smartphone running Android 4.2.2 Jelly Bean, which sent X Phone rumors swirling. Whether or not this AT&T-bound Motorola prototype is the X Phone remains to be seen, as the U.S. wireless carrier and Google have not yet responded to TechRadar's inquiry. We doubt we'll hear anything definitive on this speculative device, but we'll keep you posted. Confirmation of what the X Phone looks like, instead, may come at the Google IO conference, which kicks off on May 15.